The global grid-scale battery was valued at USD 1.1 billion in 2017 to reach USD 7.8 billion by 2024, at a CAGR of 31.8% during the forecast period. The high growth in the global market is due to the reducing costs of grid-scale batteries, increasing investment in renewable energy, government subsidiaries, and among others. Along with that, the government regulations to enhance energy efficiency is also contributing to the grid-scale battery industry growth. On the basis of type, the grid-scale battery market is segmented intolead acid, flow, lithium-ion, sodium-based, and others. Lithium-ion battery is expected to dominate the market by holding the largest share in the market in the coming years. This is attributed to its superior properties such as high power and energy density, lightweight as compared to other batteries such as nickel-cadmium and nickel metal-hydride batteries. Also, the life expectancy of these batteries are 5-15 years with 98% efficiency. Based on application, the grid-scale battery market is segmented into peak shift, ancillary services, renewable integration, back-up power, and others. Others include ramping, microgrids, black start, and transmission/distribution upgrade deferral. Renewable integration application segment holds the largest share in the market and also anticipated to witness the highest growth during the forecast period. Some of the factors attributed to the market growth are increased reliability, attainment of renewable targets, energy efficiency, security and resiliency from microgrid applications, and others. 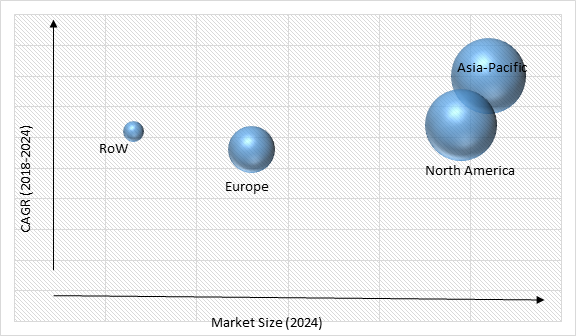 Increasing investment in renewable energy and government supportive regulations and subsidiaries to enhance energy efficiency are the major factors driving the grid-scale battery market growth. The investment in the renewable energy is increasing day by day, as it is reducing the threat of climate change and making the environment clearer. Various countries around the world such as China, India, and others are also investing in the solar and wind power to reduce the effect of climate change pollution and sustain economic growth. Environmental implications and low durability in extreme weather conditions are identified as major challenge in the grid-scale battery market growth. Understanding the environment implication of the batteries is also an important factor, as battery recycling and disposal. The environmental impact of mining the minerals that are used in the manufacturing of these batteries is also a challenge industry could face in the near future. In the near future, solar energy is expected to produce considerable electricity in the global market, which will increase the demand of grid-scale batteries considering that they are essential for negating fluctuation power in grids. Along with that, the declining cost of lithium-ion batteries is likely to drive the grid-scale battery market. During the forecast period, Asia-Pacific is expected to remain the fastest growing region for the grid-scale battery market, majorly attributed to its ever-increasing population which is creating a huge demand of electricity. Also, the increasing investment in power transmission and distribution is one of the major drivers of the region’s market growth. For instance, in 2017, India launched first grid-scale battery storage system of the country to integrate 175 GW of renewable energy into the energy system by the year 2022. This plan is commissioned and operated by Tata Power Delhi Distribution, and it is a joint project by Mitsubishi and the U.S. energy storage company AES. Various players operating in the grid-scale battery market are working on providing innovative products and solutions to the market and are investing heavily on the same. For example, General Electric released a containerized energy storage product that has a competitive storage for installation time. LG Chem, Ltd., Tesla Inc., BYD Company Limited, General Electric Company, Panasonic Corporation, ABB Group, Samsung SDI Co. Ltd., Seiko Epson Corporation, Toshiba Corporation, Fluence Energy, LLC, and GS Yuasa Corporation are some of the major players operating in grid-scale battery industry. 11.7. Samsung SDI Co. Ltd.